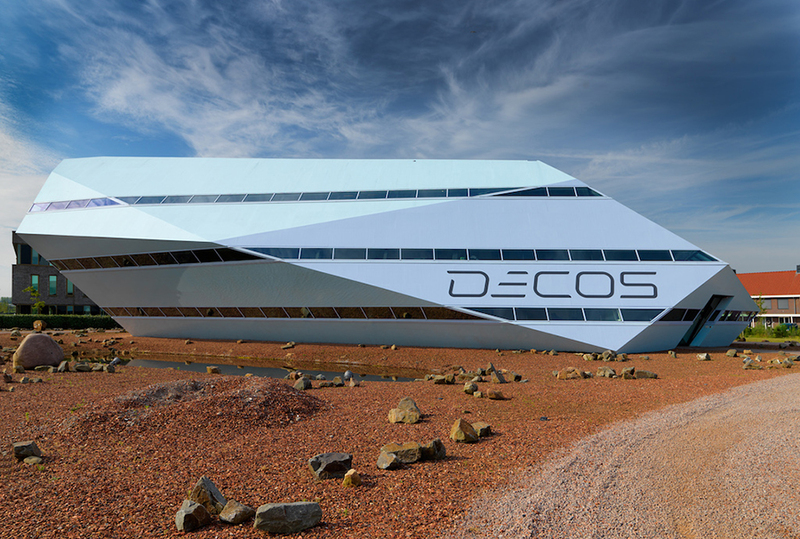 Like some angular alien architecture, Decos‘ futuristic development lab appears freshly landed in a martian lanscape. Underneath the sharp geometry and vectors, inside, the highly innovative company is inventing the technology of the future. Located in Noordwijk in the Netherlands, they are breaking new ground with Softbank’s Pepper robot, employing the social humanoid as a receptionist! Pepper waits at the entrance, dressed in a cape for Sinterklaas (the Dutch precursor to Christmas). I greet her but she doesn’t respond. Then I notice her tablet prompting me as to the nature of my visit. I indicate that I have an appointment and then speak the name of my contact, Tiago Santos, out loud. She recognises it after two tries, to my relief. A little robot, Eco, rolls up and unlocks the door for me, to lead me to my meeting. The office space is white and fresh, with modern angles everywhere and walls of glass, illuminating the alien environment outside. Over a cup of tea, Tiago asks me to fill in an evaluation form which they will use to improve Pepper’s receptionist routine. This is done on one of three large tv screens in the downstairs canteen. I offer some comments about the interaction, and the lack of feedback when Pepper didn’t hear what I said. Tiago proceeds to tell us about how Decos used to have a human receptionist, but did not have enough work to keep her fully occupied in their small Noordwijk office. Pepper has taken her place, enabling her to do other, more interesting things (is this not how one would wish robotisation would work in the future?). Pepper can speak, show videos on her tablet and take rating input. Decos hopes to distribute their robot receptionist module through human receptionist outsourcing companies. Decos is dedicated to innovation and futuristic technologies, digitising manual processes and making things smarter. They have several products created by different companies under their banner, in the areas of smart cities, smart work and smart mobility. To foster innovation while managing risk, they create small technology startups within their company. Once viability is established and a good business model is found, they invest more heavily. The company itself believes in self management – the only management being the board which steers the company and some project managers. They have the one site in the Netherlands, and one in Pune, employing a total of about 200 people. 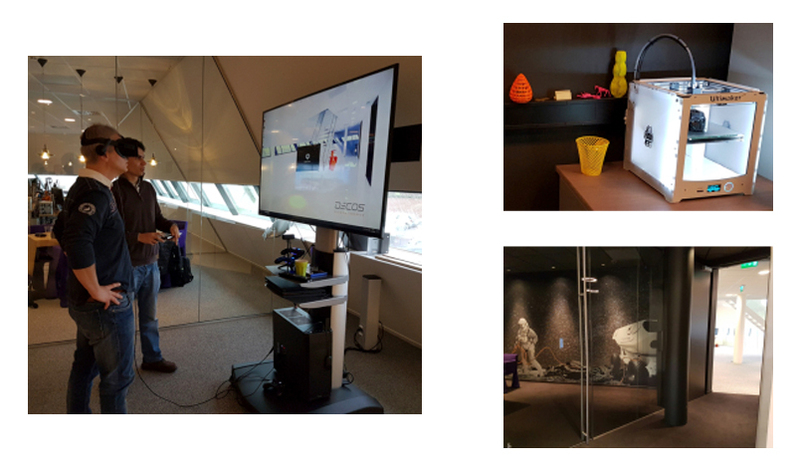 The office building is filled with awesome futuristic gadgets to increase the creativity of their staff, including an Ultimaker 3D printer and a virtual reality headset. The walls are covered in space themed pictures. There’s a telescope upstairs and an ancient meteorite downstairs. This place was born of imagination and inspiration. Eco is a little robot that rolls around rather like a bar stool on a Roomba, and makes use of Decos’ autonomous life module. It wanders around absentmindedly, pauses thoughtfully next to Tiago’s leg, and rolls on. The body is a high quality 3d plastic print, with a glossy finish, angular and reminiscent of the Decos building. It has an endearingly flat and friendly ‘face’ which is displayed on what appears to be a tablet. Another Eco unit patrols upstairs. A third prototype lies without a chassis in the development area, along with Robotnik, the next and larger version of Eco. All too soon, my visit to Decos’ futuristic development lab has come to an end. I can’t help rooting for them, and for similar companies, who show courage in embracing innovation and its risks. It seems to come with its own interesting challenges, like inventing a business model, creating a market and choosing partners and early adopters to collaborate with. Working in this space takes imagination and vision, as you have to invent the rules which will lead to the unfolding of the entire industry in coming years. Decos seems to embody the spirit of exploration which is needed to define and shape what is to come. This article was originally posted on Thosha’s AI Blog, and has been edited for publication on RoboHub.